Source Development Kit (SDK) for developing custom SyncML client applications based on Synthesis SyncML client library as well as database adaptor plugins for Synthesis' PRO server and client products in C, C++, Delphi, JAVA or .net. With this SDK, full-featured SyncML functionality based on Synthesis' mature and high quality SyncML DS engine can be integrated into custom client or server applications through well defined and stable APIs. The SDK includes a free demo version of the SyncML Client engine for all supported platforms, which allows creating SyncML applications based on SQLite3 database files or plain text. The commercial version adds support for SQL/ODBC and custom plugin database adaptors. The SDK also contains sample code like a free GUI SyncML client for Mozilla Sunbird/Lightning in source code for different platforms showing how to directly interface with complex SQLite3 databases by just using the power of the SyncML engine's XML configuration as well as how to write a custom SyncML application. Both client library API and the database plugin API support JAVA and .net languages as well as native interfacing (like C/C++, Delphi, etc.). 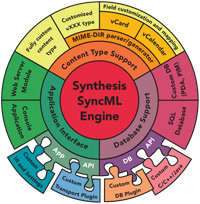 The SyncML client library consist of the same mature SyncML engine implementation as used by all of our successful SyncML client and server products - supporting SyncML versions 1.0, 1.1 and 1.2 including complex features like suspend & resume in a way completely transparent to the user of the SDK. The APIs are designed to protect investment into custom applications and database plugins. They are stable and remain compatible when the SyncML standard evolves and the SyncML engine is updated. The database API is also completely unified between client and server - database adaptors can be used unmodified in client and server applications.